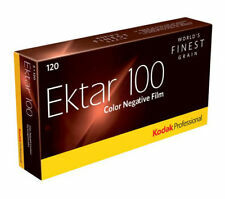 KODAK PROFESSIONAL EKTAR 100 Film is "the world's finest grain colour negative film". Described as the sharpest 100 ASA film of its type, this film is already a very popular choice with enthusiast and professional photographers who demand the very best for the finest images. KODAK EKTAR 100 120 ROLL FILM. This is made in the UK by Ilford (Harman Technology Ltd). 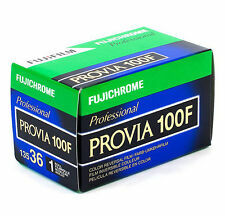 Fuji Provia 100F Professional - RDP III 135-36 - Colour Reversal Slide Film - Single Roll. A really superb 100ASA / ISO speed colour slide film from Fujifilm. The sharpest 100 ASA colour slide film in the World no less! 36 Exposure. High speed film, 400 ASA. Being rated at 400 ASA, it makes it particularly suitable for working with action shoots and available light situations. FUJI PROVIA 100F. COLOUR SLIDE FILM. 35mm 36 exposure. An excellent all round Pro. Normal saturation with natural colour rendering. E.6 slide process - processing not included. DATED 06/2019. It uses Kodak Vision Motion Picture Film Technology to achieve a fine grain and it's perfect for photographers who are looking for quality, even at bigger prints. Format : 35mm Slide film. © is based in Romford East London. The finest granularity of any 100 ISO film in the world. Sharper than many 25 ISO rated films. Is one of the UK's leading on-line suppliers. 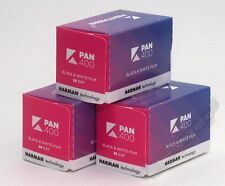 Excellent reciprocity characteristics also make this film highly suitable for use during long exposures and ensures consistent film speeds and coloring across multiple and extended exposures. This item is one 36-exposure roll of 35mm film. 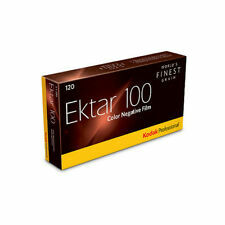 Professional colour print film Kodak claim Ektar to be the finest-grained colour negative film on the market. Scans well too. 35mm 36 exposure. Perfect for action, sports and low light photography. Ideal for those new to black & white photography. KENMTERE 400. Black and White Negative film. 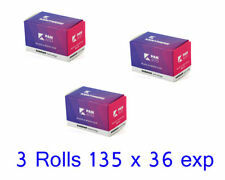 5 x Rolls New KODAK PROIMAGE 100 35mm 36Exp Colors Negative Film. Its printing characteristics are similar to those of Kodak GOLD Films to help simplify printing for photofinishers. Expiration Date: 07/2020 - // 5 Rolls. Teamwork Photo and Digital, London's professional Digital/Photo supplier. We are based in Central London in Fitzrovia close to the BT Tower and accessible easily by tube. We cannot accept any liability/responsibility in the choice of goods you have ordered. Fujifilm Provia 100 F 135/36 1 Film New Goods! Mhd / Expiry Date 06/2020. FUJIFILM PROVIA 100 F slide FILM of the latest generation. Serie Provia. Marke Fujifilm. 1 piece Small film 135/36 100 ASA. Belichtungsanzahl 36. Fuji slide film. Film with expiration 01-2020. Film for 35 mm format. Photographic film. Kodak Ektar 100 Specs. Film Format 120. Film Speed ISO 100. Film Type Color Negative. Film Processing C-41. 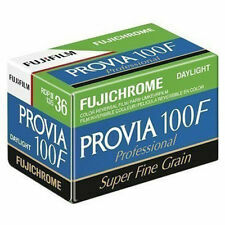 Fujifilm Provia 100 F 135/36 10 Films New Goods! Mhd / Expiry Date 06/2020. FUJIFILM PROVIA 100 F slide FILM of the latest generation. Serie Provia. Marke Fujifilm. 10 pieces small films 135/36 100 ASA. KODAK PROFESSIONAL EKTAR 100 Film is the world's finest grain color negative film. KODAK PROFESSIONAL EKTAR 100 Film is the world's finest grain color negative film. Color-negative film. Box Contains. Kodak 8314098 Professional Ektar 100 120 Colour Negative Film (Pack of 5) . KODAK PROFESSIONAL EKTAR 100 Film is the world's finest grain color negative film. Box Contains Color-negative film. We are only happy if you are happy. Need help?. Why buy from us?. 5 out of 5 stars - Kodak 8314098 Professional Ektar 100 120 Colour Negative Film (Pack of 5) . 12 product ratings12 product ratings - Kodak 8314098 Professional Ektar 100 120 Colour Negative Film (Pack of 5) . KODAK PROFESSIONAL EKTAR 100 Film is the world's finest grain color negative film. Box Contains Color-negative film. KODAK PROFESSIONAL EKTAR 100 Film is the world's finest grain color negative film.